Today during a session of Tourism Market Perspective where the student groups were supposed to present an accommodation concept, I had another confirm that my thoughts about a person were more than justified and full of sense. What happened is that one of the group holding a presentation deliberately failed in the task of following the guidelines of the assignment, hence not by skipping any of the subpoints but literally changing the main goal of the essay, which required to create an accommodation concept for an ethnical minority in the Netherlands after having defined the consumer profile and the target market through primary and secondary research. "well, we figured out a very nice concept for offering a unique customer experience, BUT... we also figured out immediately that at the economic and market level there was no room for an ad-hoc accommodation structure, so we decided to work on a collaboration with three already existing structures, being able like this to focus on the real customer experience". At this point, if I was the professor, as an innovative person such the one I think to be, their non-linear thinking process would indeed deserved 10 points out of 10. Maybe after having considered how clearly the class appreciated the work, the REAL professor remarked the fact that the guidelines had not been follown but than gave his congratulations to the group. Concerning the person who came up with the idea, I was almost sure it was him, in fact, I received his confirmation some hours later when I went upstairs to talk to him as I regularly do. Now, although I fully understand our main incongruences in terms of thinking and beliefs, I recognise in him the genius and the full potential of contributing to the development of any community, region, country or even world. Additionally, as probably with no other person I am able to do, I can accept his suggestions and compare my ideas to something concrete. I really see myself in his capacity to elaborate information and produce logical thinking which differs from the one of the main-stream. I seriously think that this reflection come from the fact that too often I feel alone along the way toward my "surreal" goals of doing something concrete for the sake of serving that fraction of the world which truly urges my service. 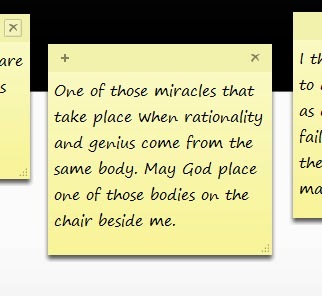 Concluding, I wish for me and for you that are reading this, a future full of rationality and genius in the same body. Be that person you, the one beside you or even better both.